The problem with HIV is that it attacks and kills the very cells of the immune system that are supposed to protect us from infections — white blood cells. But a new technique, developed by scientists at The Scripps Research Institute (TSRI) in La Jolla, California, offers a distinct HIV-killing advantage. Once inside a white blood cell called a CD4, the virus takes over the cell's DNA and uses it to make copies of HIV. The new viruses burst out of the cells, killing them in the process. So, not only is HIV multiplying, in the process, it is killing the immune cells that should be defending our bodies against it. HIV is one tough virus. It is an expert at eluding the body's defenses by hiding out where the immune system can't find it. And if any virus is left in the body, the infection can flare up again. That's why more than 1.2 million people in the US are living with HIV. We can (mostly) control it with antiviral drugs, but we haven't been able to eliminate it from the body completely. Antibodies are specialized proteins that fight foreign bacteria and viruses in the body and, whether produced by the body or injected in a vaccine, they usually float around in the blood, just hoping to encounter an infectious agent. The research team at TSRI discovered a way to engineer antibodies so they'd stay in the way of the pathogen — by having them attach to the surface of immune cells. There, they block HIV from gaining access to cells and setting up an infection. But that's not all. Not all the immune cells end up with the engineered antibody tethered to them, and those can still be infected and killed by HIV. That means that the cells that survive are uninfected with HIV. While dying immune system cells sounds like a bad thing, in this case, it's a critical step in ridding the body of HIV. The research, by senior author Richard A. Lerner and colleagues, were published online April 10 in the journal PNAS, then included in the May 2, 2017, issue. The scientists developed their antibody to cling to a cell's surface — the cells HIV wants to attack — and there they block HIV from accessing a critical cell receptor they need to gain access to the cell and set up an infection. In preliminary testing, the research team set up a system using rhinovirus, the common cold virus. The researchers used a virus, called lentivirus, to deliver a gene into human cells in a petri dish. The gene caused the cells to produce a type of antibody that binds to a receptor on the human cells needed by rhinovirus to enter the cell, called ICAM-1. Once produced by the cells, the antibody remained tethered to the ICAM-1 receptor. When the researchers added rhinovirus to the cells, most of them died from the viral infection — because the antibody did not protect most of them. However, after 125 hours, those cells whose ICAM-1 receptors were covered with an antibody were still alive. And, more importantly, they were uninfected. Cells without antibody protection died off, leaving protected cells to survive and multiply, passing on the protective antibody-producing gene to new cells. 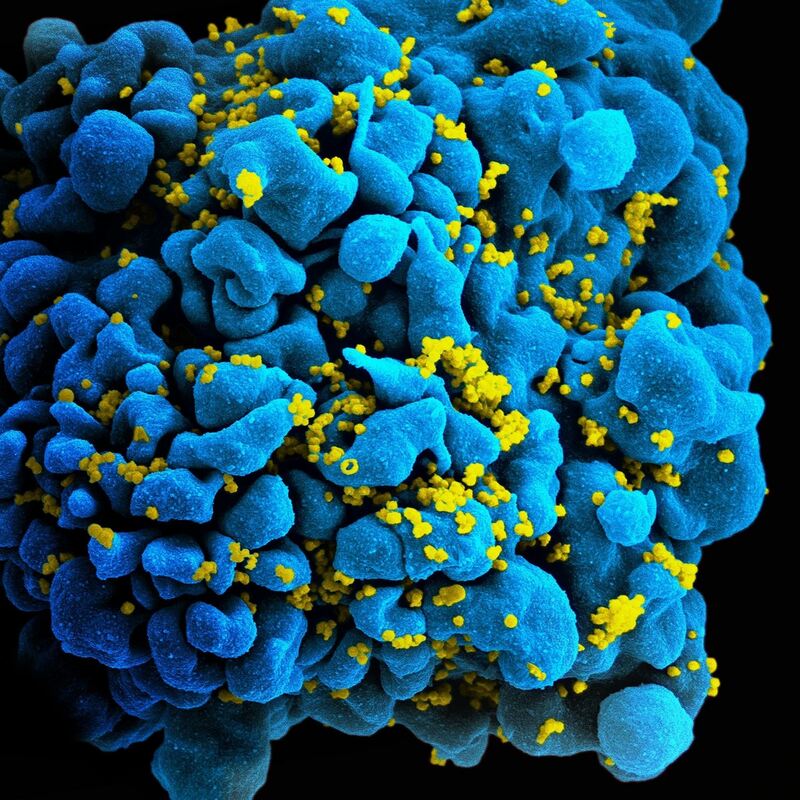 The scientists had succeeded in forcing the cells into a survival-of-the-uninfected game, so they moved on to try out the technique with HIV. We know that HIV binds to the CD4 receptor on a subset of white blood cells. Finding the appropriate antibody for the CD4 receptor was a little trickier. They didn't want whatever antibody they chose to block critical functions of the cell. Luckily, because there are whole libraries of antibodies to select from, the scientists found an antibody that could block virus infection while not interfering with the normal functions of the receptor. Again, their technique worked. The scientists chose genes to insert into the DNA of CD4 cells that would produce antibodies to HIV. Like the rhinovirus experiment, the antibodies from these genes ended up tethered to their surface and blocked the HIV from getting into the cells. After HIV was added, the cells without antibodies covering the CD4 receptors became infected and died, but those with antibodies on their surface survived, and the antibody prevented them from getting infected with HIV. This novel technique represents a potential mechanism to eliminate HIV infections, instead of just controlling it with antiviral agents. No more residual virus hiding out in small undetectable pools of immune cells. In this system, they would have no hiding place, because there'd be no cells they could infect without killing them. In humans, this process would require a kind of genetic engineering. Doctors would infect patients with a virus that would insert a gene into their cells which would make the protective antibodies. Doctors could use this same approach for "vaccination, passive antibodies, or small molecule drug therapy," according to the study's authors. "All these approaches are aimed at HIV itself, whereas MTAs (membrane-tethered antibodies) target the host and work in conjunction with the process of selection." In the ultimate coup, "paradoxically, the virus becomes the driving force for selection of a resistant host who no longer harbors virus." I wish there was a cured because the AZT are not a normal way of living when you get more problems . they take Your eye site .they cause blurry vision and eye floaters and also so dry eyes when you tell your doctor this they just tell you that my other patients don't have any problems taking it . I have asked to switch my medication and she will not do it I wish I could sign up for a trial to try a cure but they never have one in Knoxville TN .or I would sign up.